Bold new styling, a luxuriously-appointed interior, an agile chassis and a can-do price make the 2016 Kia Optima the hottest bargain of the year. You could not ask for more in a reasonably-priced full-size sedan. Well, you could ask, but you won't find a car that offers more bang for your buck than the new Optima. 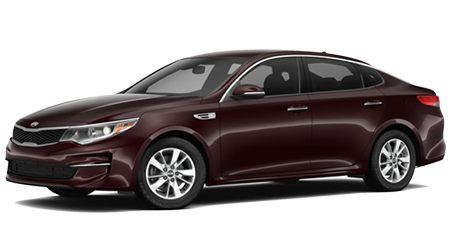 To experience the standout appearance and heart-stopping high performance of the 2016 Optima, head down to Cumberland Kia, TN, where the new Optimas have just landed. See the latest Kia Optima in its best light, and in all the available colors and trim levels, in our inviting showroom. As one of the largest Kia dealerships in all of TN, we have seen the Kia brand grow to maturity in a few short years, going from a practical carmaker to a wildly inventive firebrand of cars that people are thrilled to own. Although the Optima is not classified by Kia as a full-blown luxury sedan (let's call it a premium car) it has many convenience features that the big luxury car manufacturers have not even thought of yet - but they will, soon! For example, the Optima's amazing Dynamic Bending Light (DBL) works together with your LED headlights to bend the light beam as you go into curves. That is pretty heady science, and we would love to hear your kid's science teacher try and explain it. Another first for Optima is the "smart" trunk, which opens when you stand in front of it for more three seconds, when you have the Keyless Entry fob in your pocket or purse. It means you just stand behind you car with your hands full of grocery bags, and in 3.1 seconds, the Optima thoughtfully pops the trunk open for you. There are umpteen reasons to check out the all-new Optima, so hop, skip and jump to 1560 Interstate Dr in Cookeville, CA for a first-hand look. If you live near Lebanon, Crossville, Mcminville, Franklin, and Chattanooga, you are freeway-close to the true home of the Kia Optima, Cumberland Kia. Our customers come from Lebanon, Crossville, Mcminville, Franklin, and Chattanooga, and beyond, so make us your destination dealership for a sweet deal on the totally awesome 2016 Kia Optima. Wow! The inside of the 2016 Optima is breathtaking, and you can tell that Kia's brilliant chief designer Peter Schreyer had a big hand in the redesign. No wonder Optima has been selling like hotcakes! The interior is sumptuous and inviting, with or without the Nappa leather option. There is real metal trim on the doors and dashboard, and the dash layout is split-level, with an upper display screen and a lower control panel. The cockpit of the Optima is punctuated by clean lines and easy access, and there is a simple elegance in its straightforward presentation. For those of you who are naturally attracted to more of everything, there is the all-encompassing Premium Technology package, which includes adaptive cruise control, front-collision warning, an electronic parking brake, lane-departure warning, and an autonomous emergency braking system that applies the brakes automatically to avoid a collision. It makes no sense to buy any other sedan, when the 2016 Optima gives you more features (and style) for a lot less money. 2016 brings the boldest and most powerful Kia Optima ever. It's available in a nice selection of trim levels and accessory packages, and you are sure to find one at Cumberland Kia that tickles your fancy. We have several engine options and even a hybrid version of the new Optima, so be prepared to be amazed. We are centrally located at 1560 Interstate Dr in Cookeville, TN, and just a stone's throw from Lebanon, Crossville, Mcminville, Franklin, and Chattanooga. The 2016 Kia Optima is finally here - we'll be expecting you shortly.